We are seeing a LOT of amended loans in industry after industry - I find it a bit curious that banks can do this with all the stresses they have, but I would assume there is some government pressure behind this sudden influx of "don't worry about it, we'll just change the terms". 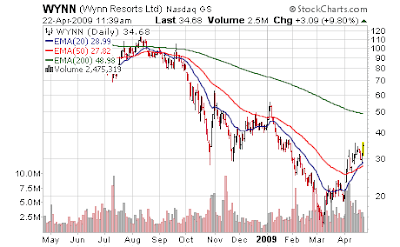 Both Las Vegas Sands (LVS) and Wynn Resorts (WYNN) are seeing very nice stock action today, off of amendments. This is much more important to Las Vegas Sands than Wynn based on their financial situations, but obviously a net positive to both. These type of announcements create yet another hazard to being short (anything) at this time... now the question becomes how much of the weakness in these stocks has been due to a lack of traffic in Las Vegas, and how much was due to fears of inability to service their debt (especially true for Las Vegas Sands and MGM Mirage). Tough one to figure out. Casino companies Wynn Resorts Ltd. and Las Vegas Sands Corp. each said Tuesday that they amended their debt agreements to get more breathing room as they repay billions of dollars in notes. 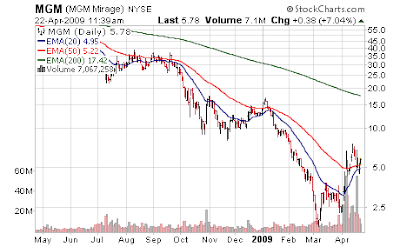 All four of the largest U.S. casino companies -- MGM Mirage and Harrah's Entertainment Inc., in addition to Las Vegas Sands and Wynn -- have sought new debt agreements to help them cope with falling revenue during the global recession. Wynn Resorts said its new agreement waives certain covenants until June 2011 and extends to July 2013 the maturity on $610 million of its remaining $697 million in revolving credit. The Las Vegas-based company run by billionaire Steve Wynn, who owns 21.4 percent of its outstanding stock, says that, in exchange, it has agreed to a higher overall rate on the debt. Wynn Resorts said its rate would increase to 2.6 percent above the London Interbank Offered Rate, or Libor, from 1.7 percent above Libor. (so in return for breathing room they have to pay about 1% more on the debt; I think that's a good deal in this environment) The company said it has $4.5 billion in long-term debt and more than $1.3 billion in cash. She estimated that the extra loan costs will decrease the company's 2009 earnings per share by 5 cents. "We believe the new terms give Wynn greater flexibility to manage through the worst down-cycle ever experienced by the company," Sanford Bernstein analyst Janet Brashear said in a research note. 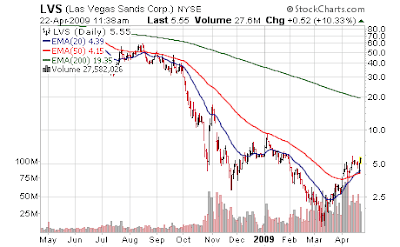 Las Vegas Sands -- which had $10.47 billion in long-term debt as of Dec. 31, according to its 2008 annual report -- said in a regulatory filing Tuesday that the agreement it reached last week with its lenders lets it buy back up to $800 million in debt. MGM Mirage, which reported $13.5 billion in debt as of the end of last year, also has been considering selling casinos and other assets to shore up its balance sheet as it works toward finishing the $8.7 billion CityCenter complex on the Las Vegas Strip. CityCenter is a 50-50 partnership with Dubai World, the investment arm of the Arab emirate. Harrah's, which said it ended 2008 with $23 billion in long-term debt, recently exchanged $5.5 billion of it for about $3.5 billion in cash and new notes at higher interest rates. The company, which has struggled with its debt since it went private in January 2008, said it tendered about 64 percent of its eligible debt with the offer.